Curd nod: Chilli chicken meets curd rice. It appears, the term “Bangalored" entered this city’s lexicon well before a recently pink-slip true-red American sold the very first T-shirt on Cafepress bearing the words “Don’t get Bangalored" to vent his anger against jobs outsourced to India. The first thing that was “Bangalored" in a commercial sense was biryani, in 1977. That was the year K.V. Ramana Reddy opened RR Restaurant, the Andhra eatery in Gandhi Nagar and on Church Street. RR’s success set the stage for hundreds of Andhra-tandoori-Chinese restaurants, each with its signature Bangalored dish. The most popular are Bheema’s, Nagarjuna and Nandhini, where patrons devour Andhra chilli chicken and Chicken 65 with curd rice. According to Gautam Krishnakutty, owner-chef of Tai Tai, a pan-Asian restaurant on MG Road, “This (chilli chicken) is often made with a dollop of soy sauce, some cornflour, a thousand green chillies and, I’m quite sure, a fistful of monosodium glutamate." Bal Venkatesh, the cook at Bheema’s, says: “I only use 100g of green chilli for every kilo of chicken. I also use soya sauce, chilli sauce, and cornflour." That principle of tempering flavours of another region with the city’s own extends to street food. One of the city’s finer practitioners of “Bangaloring" food is L.R. Jagdish who, when he is not frying bhajjis near Jayanagar 4th Block complex, runs a bhelpuri cart near Vijaya Junior College. “The north Indians use boiled Kabuli channa that has been cooled. I use piping-hot green peas. Nothing tastes good cold," he says, simultaneously assembling a plate of masala puri and tangy-sweet bhelpuri for two students. “It tastes much better and spicier than the chaat I once ate in Delhi," says one of the students, Saumya S.
While the immigrant bhelpuri on Bangalore’s streets has remained largely unaltered, several chefs in the city say the dish that has undergone the most significant transformation is Mughlai biryani, especially the one sold at restaurants in Shivaji Nagar. Krishnakutty of Tai Tai, an avowed fan, describes it as “lovely, greasy ‘Shivaji Nagar Taj’ biryani made with potatoes, small grain rice (not basmati), and served with a watery (but delicious) dal". Turmeric is used to mimic saffron. Mohammad Ilyas, owner of Grand Taj, Shivaji Nagar, says: “We use a blend of masalas unique to Bangalore. There’s coriander, ‘garam’ masala, ginger and yellow Bush colour." “We cook the mutton in the masala and then layer the boiled rice on it." Ilyas, whose family has cooked and sold biryani for four decades, said about 400 plates are consumed at his restaurant every day. Talk like this does not bother Regan Kumar, the 23-year-old chef at Empire Hotel, who garnishes his dry chilli chicken with flash-fried curry leaves, capsicum and green chillies. “Come here in the evening and see how many people order this dish. After the oil kebab, our chilli chicken is the most popular item," he says. 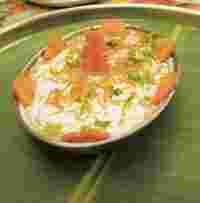 Krishnakutty adds, “I have had bhelpuri with freshly grated coconut on top of it. You can’t possibly get more Bangalored than that." Yes, you can. Try rossogolla chaat at Gangotree in Koramangala.